"Analyse harmonique des équations aux dérivées partielles elliptiques et paraboliques"
This conference aims to present a range of recent advances in harmonic analysis of partial differential equations. These advances are based on a common circle of ideas, but are happening at such a rapid pace that no expert has yet been able to develop a global vision of how the field is evolving. By bringing together some of the leading experts in the field, this conference aims to collectively develop such a vision. By sharing this development with a large number of early career participants, the conference also aims to ensure that the domain remains vibrant and innovative. • Differential operators with L infinity coefficients, and singular integrals theory beyond the Calderon-Zygmund framework. • First order differential systems, Dirac operators, and Hodge theory in Lp. • Adapted function spaces for rough differential operators (tents, Hardy, BMO, and Besov spaces). 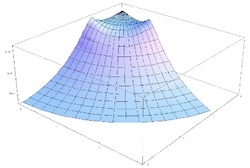 • Elliptic boundary value problems on non smooth domains (such as Lipschitz domains). • Parabolic PDEs with L infinity coefficients, and their stochastic analogues.